According to the National Rosacea Society, 90% of people with rosacea said having the condition lowered their self-esteem. Many people with rosacea suffer in silence for years before finding relief with the help of their dermatologist. Martha Arroyo, MD, PhD, FAAD helps patients manage their symptoms so they feel like themselves again. 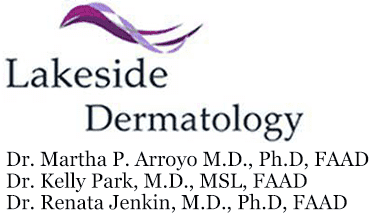 If you suffer from rosacea, schedule an appointment with Lakeside Dermatology’s Gurnee or Libertyville, Illinois, office today. Rosacea is a chronic skin condition that usually appears as redness in the cheeks, forehead, nose, and chin. Most patients first notice it after the age of 30, and it seems to flare up and disappear over time. Without dermatological treatment, rosacea redness can become more pronounced. In some cases, blood vessels appear. In more severe cases, pimples and bumps develop. The nose can also swell, giving it a bulbous appearance. In some people with rosacea, the eyes appear irritated or bloodshot. Rosacea is common among women with fair complexions. There is no known cause of rosacea, nor is there a cure, but advances in dermatology make living with rosacea easier than ever. Rosacea can’t be cured, but you can manage its symptoms. Dr. Arroyo has several options to improve the appearance of your rosacea. The National Rosacea Society studied more than 1,000 people with the condition. Nearly all of them said they could identify their rosacea triggers, which allowed them to reduce flare-ups by avoiding them. Common triggers include stress, heat, cold, sunlight, alcohol, exercise, spicy foods, and certain skin care products. Dr. Arroyo can help you identify any lifestyle and environmental factors that seem to trigger your rosacea so you can avoid them. Dr. Arroyo also recommends several oral and topical medications to help with rosacea symptoms like redness, dryness, pimples, and bumps. To supplement your dermatological care, Dr. Arroyo provides a treatment plan for you to do at home, which includes moisturizers and sunscreens designed to prevent flare-ups. Take the first step toward clear skin by calling or booking your appointment with Lakeside Dermatology online today.